Are You Seeking a Physician in Columbia Heights? No matter the situation, you can count on us for exceptional care. Give us your name and email address and we will send you our New Patient Forms to make your initial visit faster! Whether you’re searching for a new primary care doctor or you’re in need of an urgent care clinic, the team at Medics USA is here to lend a helping hand. High quality care is our milestone, and there’s nothing we love more than offering our clients a level of service that is simply unmatched. If you’re looking for a new primary care doctor in Columbia Heights, we’d love to hear from you. View our full list of services below. 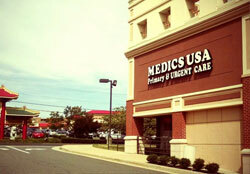 The Medics USA office in the Columbia Heights neighborhood of DC offers both primary care and urgent care. We are accepting new patients. We accept almost all insurance plans, Medicare, and Medicaid. Spanish spoken. Khurram Rashid, MD, a well-known instructor and lecturer, is the founder and Medical Director of Medics USA. He did his Residency at the New York Medical College. Dr. Rashid is also a Civil Surgeon, qualified by U.S. Citizenship and Immigration Services to conduct immigration medical exams. Erdenesuren Jambal is a Family Nurse Practitioner trained at Georgetown University. Before her FNP certification, Erika spent 6 years as an RN in DC and Northern Virginia, and for 4 years she was an Instructor in the Certified Nurse Aide program at Columbia College in Fairfax VA.
Go to our Occupational Care page for more info. We offer same-day appointments at our Columbia Heights office – call today or book your appointment online! We are located on 14th Street NW, between Girard St. and Fairmont St.